Thursday was our one full day in New Orleans. Of course we had to try out the Beignets at the famous Café Du Monde. These, by the way, are delicious. It’s probably a good thing we can’t get them here at home or I would be in trouble. This was followed by a stroll through town checking out galleries. Our favorite was Angela King Gallery . Check out the paintings by Andrew Baird. They’re huge and up close they resemble Jackson Pollock, but step back and the image appears. Very striking. Mostly, we appreciated the tour we received by Ellin Egan, Professional Fine Art Consultant, who patiently gave us an art appreciation class while we cooled off in the A/C. Have I mentioned how hot it was outside? We also hunted down the CDs from the musicians we had heard on Wednesday night, Dwayne Burns, trumpet and vocals, and Chuck Chaplin, piano. Next, it was find the street car (which looks like something out of a 1930s movie) and take it to the Garden District for a grueling self-guided walking tour of historic homes…. all of which were spared by Katrina. Built on High Ground they were. After being turned away by the prestigious Commanders Palace Restaurant because Steve was wearing shorts (It’s 110 degrees outside for cryin’ out loud! ), we took our macabre mood to Cemetery #1. Ever wonder why all the New Orleans movies show above ground crypts for burial? The water table is so high, the bodies would float. Not good. However, some of these crypts are quite old, with numerous family members enclosed…. And they seem to be falling apart. Also not good. After that cheery visit, we headed back by street car to our hotel to escape the heat and take a nap. had had to eat were those Beignets? And then our room had not been cleaned and the maid was still working her way to our room, which meant no nap or shower until she came and left…. Sigh…. I really don’t like myself when I get cranky. I don’t think anyone else likes me either. My dear husband, thank God, still loves me even when I’m cranky. I don’t know why he chooses to, but I’m grateful. I got to apologize, again, and he got to forgive me, again. We went to dinner at Irene’s which was amazing. If you ever go to New Orleans, eat here. Really. Call ahead and if you’re lucky, you’ll get a reservation. It was a lovely final dinner of our vacation. I wish we could have lingered a bit longer, but we had a date with the blues. Our waiter made sure we got out on time. Our Blues date was at a place called Snug Harbor. A gallery owner had told us this is the place to go if we really want to hear our music! It’s a bistro, a bar, and a music hall. All in three separate rooms. You pay to go into the music room to hear the music. Yes. They will bring you drinks but they’re not required. This night it was Spencer Bohren who was playing Steel Lap Guitar, Acoustic Guitar, Electric Guitar, and Banjo. It was nice. It wasn’t rock your socks off jazz or Creole zydeco music. But it was nice slow blues from a local musician. We enjoyed the show. We walked back to our hotel. This was our last night before flying home. Tomorrow – it’s the Ninth Ward and Drive-Thru Daiquiris. Sorry to tell you this but you CAN get the Cafe Du Monde Mix at the stores around here. Try Cost Plus or a nice grocery store. 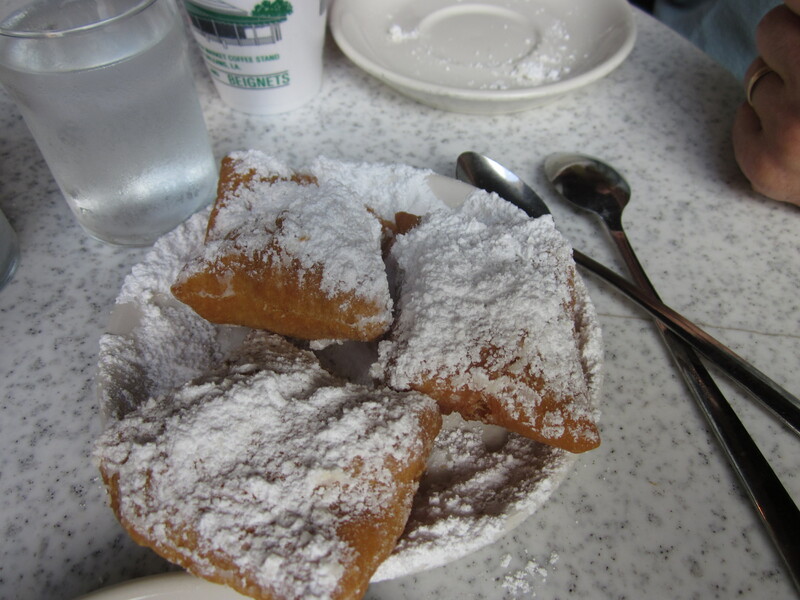 When you’re feeling adventurous you can make your own beignets. In Paris, I had them with “chocolate paste” aka Nutella. LALALALALALA I can’t HEAR YOU!!! The temperature today was a little below normal. You hit the nail on the head with your temperature post. The heat index has been around 110 for more than just a few days this summer. Thanks for the confirmation. How did anyone get anything done before air conditioning? Well, a few years ago we had a lot more shade and grass and a lot less concrete. Much could be done without using a car. Also the average person weighed about 30 pounds less – maybe more than that. Oh, and we wore nothing made of wool – cotton might get wrinkled but it was cooler. Main meal was a “lunch” or dinner and heated again late in the afternoon for supper so as not to heat up the house before bed time. There is more but it was a way of life I reckon. Fawn & I had toasted soda bread & Nutella for breakfast in Ireland many a day. I’m thinking if I had to put my Nutella on anything, I’d prefer the Beignet to the toasted soda bread. But that seems just like gilding the lily.